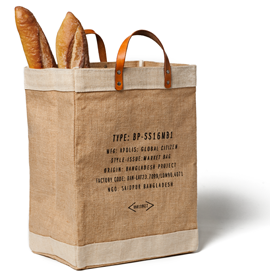 Along with your cycling pullover and Kanvas by Katin trunks, you might want to look into picking up Apolis Activism’s latest product– the Market Bag– which is made in conjunction with Saidpur Enterprises in Bangladesh. Saidpur, Bangladesh. Bangladesh was established after the war for independence in 1971. With independence came famines, natural disasters and widespread poverty. The non–profit Saidpur Enterprises started manufacturing Market Bags to help rebuild the economy and create opportunity for the whole supply chain — farmer to manufacturer. Also, just found out from Robin Long that the Parton brothers behind Apolis Activism are from Santa Barbara! How did I not know that before?? And does someone want to kindly introduce me? ?